Recommended as a biologically active food supplement, an additional source of iron, vitamins A, E, B6 and arbutin. 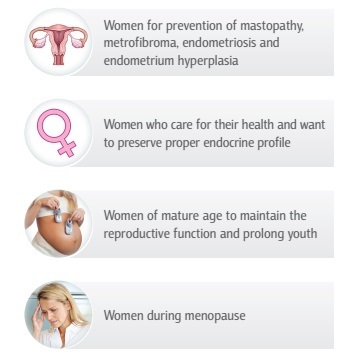 Women who want to prolong reproductive phase (fertile period). Normalizes female hormones’ metabolism, supports reproductive functions. 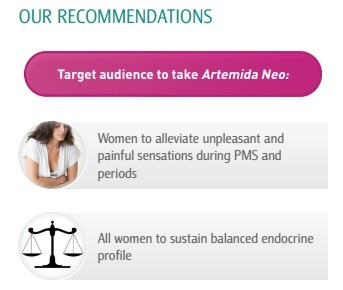 Comprehensive action of Artemida Neo sets the proper hormonal balance, suits every young woman and if taken regularly, is able to prolong the reproductive phase, and consequently—female youth. 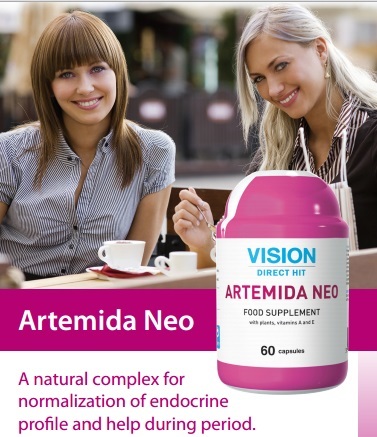 Unlike synthetic hormonal drugs, it contains hormone-like plant ingredients and has a much safer action, which makes Artemida Neo a highly safe remedy. Not only it can substitute the action of hormones, but also increase receptors’ sensitivity to those.